Randal Montgomery, for the respondent. The appellant, Lien Huong Huynh, appeals the decision of a visa officer not to issue immigrant visas to the appellant’s parents (the “applicants”) and her brothers (the “dependant applicants”). The appellant immigrated to Canada in January 1998. She was sponsored as a fiancee and married her sponsor, Sau Thuan Lam, within a week of her arrival. On March 11 1999 the appellant filed an undertaking of assistance, co-signed by her husband, for the purpose of sponsoring the applicants and dependant applicants to Canada as permanent residents. The visa officer refused the application on the grounds that the appellant did not meet the financial sponsorship requirements as set out in section 5(2)(f) of the Immigration Regulations, 1978 (the “Regulations”). These Regulations require that for the 12-month period preceding the date of the undertaking, the sponsor’s income, less all payments made or due on account of financial obligations [See Note 1 below], must be equal to or greater than the Low Income Cut-Off figure specified. The visa officer determined that the amount available to the appellant to sponsor was below the Low Income Cut-Off requirement of $40,479 for a family of six persons [See Note 2 below]. “payments made or due on account of financial obligations”, for the purposes of section 5, includes business and investment expenses that are deductible under the Income Tax Act, but does not include payments on a first mortgage loan or hypothecary loan, or payments for rent in respect of a principal residence;. Note 2: This figure is obtained by determining the size of the sponsor’s family unit and applying the applicable LICO figure from the document Low Income Cut Offs (LICOs) published annually by Statistics Canada under the authority of the Statistics Act. Section 5(2)(f) and 5(3) of the Regulations. The appellant does not contest the visa officer’s conclusions. She concedes that the refusal to grant immigrant visas to the applicants and the dependant applicants is valid in law. The appellant appeals to the discretionary powers of this Board as set out in section 77(3)(b) of the Immigration Act (the “Act”) [See Note 3 below]. In particular, she submits that there are compassionate or humanitarian considerations that warrant the granting of special relief. (b) on the ground that there exist compassionate or humanitarian considerations that warrant the granting of special relief. One of the factors advanced by the appellant in support of her claim for special relief is that she is now able to meet the financial requirements set out in the Regulations. Specifically, for the 12-month period immediately preceding the hearing of this appeal the appellant’s income and that of her husband, less all payments made or due on account of financial obligations, was approximately $44,800 which exceeds the current required income of $40,479 for a family of six persons. The appellant also advances other considerations in support of her claim for special relief. She testified that she sponsored the applicants because she misses them and would like to be reunited with them in Canada. She said that prior to immigrating to Canada she lived with the applicants and the dependant applicants in Vietnam. She stated that she immigrated to Canada to be with her husband but that she intended to continue to visit her parents and to sponsor their immigration to Canada. She also explained that as an eldest child she had a filial duty to support the applicants in their elderly years. The appellant communicates regularly with the applicants and the dependant applicants by telephone and by mail. Counsel for the appellant submitted that there are sufficient compassionate or humanitarian consideration that warrant the granting of special relief. He argued that the appellant’s current ability to meet the LICO amount, considered with the close relationship she has with the applicants and the dependant applicants, her desire to be reunited with them, and her filial duty towards the applicants warrant the granting of special relief. Counsel for the respondent argued that the appellant’s current income status is not a sufficient factor for the exercise of discretion in the appellant’s favour. He further stated that the fact the appellant misses the applicants and the dependant applicants is also insufficient to warrant the granting of special relief since it is inherent in all sponsorships. The respondent’s counsel further argued that to allow the appeal would not further the family reunification objectives of the Act since the appellant’s sister in Vietnam is not eligible to immigrate to Canada. The family therefore could not be reunited here. Moreover, the respondent argued that the appellant chose to leave her family in Vietnam and so can not now argue that she should be reunited with them on compassionate or humanitarian considerations. The issue to be determined is whether there are compassionate or humanitarian considerations that warrant the granting of special relief. Central to this, in this case, is the whether the circumstances cited by the appellant in support of this appeal are relevant and when considered together warrant the exercise of discretion in the appellant’s favour. What constitutes compassionate or humanitarian considerations? Note 4: Chirwa v. M.M.I. (1970), 4 I.A.C. 338, (I.A.B. ), p.350. – The relationship of the appellant to the applicant. The strength of that relationship, whether the applicant is financially dependent on the appellant and/or whether the appellant has cultural duties or obligations towards the applicant. – The number of family members the appellant has in Canada. – The ease of travelling to see the applicant. – The circumstances of the applicant abroad and whether the applicant faces hardship there. – Whether there are negative factors that militate against the granting of special relief. 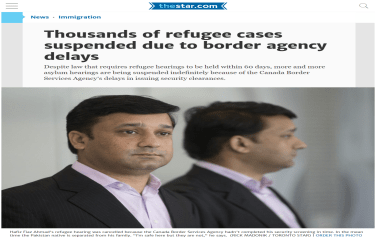 – In what manner does the applicant fail to meet the admissibility requirement? Note 5: Jugpall, Sukhjeewan Singh v. M.C.I. (IAD T98-00716), Aterman, Goodman, Townshend, April 12, 1999. Note 6: Lam, Maggie Hung v. M.E.I. (IAD T99-05731), Kelley, April 14, 2000. The relevance of overcoming the impediment to admissibility at the time of the hearing should be viewed in the context of the long accepted proposition that the degree of compelling circumstances should be commensurate with the obstacle to admissibility in order to justify the granting of special relief. Thus, the closer a person is to overcoming the barrier to admissibility the fewer other compelling factors will be needed to succeed on appeal. The logic of this approach is illustrated in the medical inadmissibility example provided in Jugpall and quoted above. Therefore, a complete surmounting of the ground of inadmissibility weighs very heavily in the Appeal Division’s assessment.